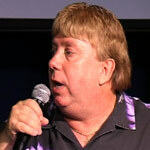 "From Preacher Of Hatred To Preacher Of Love"
Johnny Lee Clary learned to hate at a very young age. He was raised in a family filled with racism, anger, and bigotry. As a young teenager, after his father committed suicide and his mother abandoned him, Johnny found himself alone and looking for someplace to belong. At 14 he was seduced by the teachings of the notorious David Duke and the Ku Klux Klan, and he joined the organization. Today Pastor Johnny Lee Clary is a changed man, he is a Civil Rights Speaker and Internationally acclaimed Motivational Speaker & Evangelist. This is his compelling story about how Jesus taught him to love the man he formerly hated and vitimised.